Free half hour consult with a family law lawyer. A good lawyer understands the law, takes the time to listen to your needs, understands what’s important to you and clearly explains your options. I was called to the Ontario Bar over five years ago and became a Family Lawyer so that I could help empower others to take control back in their lives. Whether you’re going through a separation, adopting a child, dealing with child support or custody issues, emotions can run very high and I know the law can be overwhelming and complicated. I believe in doing the right thing to minimize conflict and putting the needs of the children first. I take a very collaborative approach to help you save both time and money. My clients have called me tough but reasonable. I’m only involved as much as I need to be and I provide you with enough legal information so that you can understand the consequences and opportunities of your unique situation. I attended Queen’s University and received my Juris Doctor (J.D.) degree with honours. While attending Law School, I was an active member of Pro Bono Students Canada, the Canadian Lawyers for International Human Rights and the Labour and Employment Club. I’m committed to giving back to the community and have been a Girl Guide leader for over 10 years. If you are thinking of leaving your spouse, the ideal time to reach out to a lawyer is before you leave the matrimonial home just so you can understand all your options. It doesn’t mean you are obligated to proceed with the divorce, but it will allow you weigh your options, preserve your entitlements and potentially save you thousands of dollars. Please look at our quick tips video series on our Youtube Channel. Based in Whitby Ontario, Elm Law is a boutique law firm dedicated to providing capable and resourceful legal counsel in a cost-effective manner. The firm is focused on providing legal advice in two areas: Estate Litigation and Family Law. 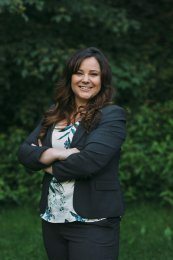 As a Family Lawyer, Stephanie's role is to be involved in aspects of family matters and domestic relations including separation and divorce, marriage contracts or “prenups”, common law or domestic partnerships, spousal support/alimony, child custody, adoption, division of property and negotiating settlements. She has experience in multiple levels of the family court system, including custody claims, complex property division, supervised access with Durham Children’s Aid Society (CAS) and the Family Responsibility Office (FRO). Stephanie is no nonsense and cuts to the chase - any separation is a horrible process and she likes to see her client’s issues resolved as quickly and cost effectively as possible.